I don’t have much experience with Bender not being a good boy when he gets his shot. He is rather docile and I’ve trained him well. So when he does receive his shot of insulin he doesn’t fuss about it. But I know not all dogs are like that. Some commenters have said that their dogs are any where from fussy to aggressive. They would like to know what can be done to get their dogs to be good about getting their insulin shot? The only thing Bender isn’t thrilled about is getting his nails clipped at home. At the Vet he is a perfect angel. But at home he will do everything he can to get away. After fighting with him to cut his nails I realized I’m letting him win and I’m not making the event fun for him (I’m not mean about clipping his nails, he just doesn’t enjoy it). Letting Him Win: I was letting Bender win by letting him get away/avoid the situation. If he was kicking and trying to mouth his paw/my hand I would let him to a certain extent or not correct him enough. Which after I stopped letting him win, I was able to cut a few more nails but really could only do about 2-3 nails per 5 days. I ending having to have help, I would restraint Bender while some one would cut his nails. Restraining Bender doesn’t mean I’m hurting him in any way. There are certain ways you can hold a dog which makes it difficult for them to move. Google “how to restrain a dog” or ask your Vet about safe ways to restrain your dog. By restraining Bender I was able to do about 2 paws before he really had enough and not wanting to traumatize him I would let him go. Neither technique was really affective until I started making the situation as enjoyable as possible. If I was able to cut his nail, I would reward him with praise. Then when we were done he would get a treat. This isn’t a quick solution either. I will have to continually work with Bender to be able to clip his nails without him fussing. It will be the same way when giving your dog an insulin shot. Look at the situation you are putting your dog in when giving them a shot. You are asking them to lay down, You are hovering over them, they feel the shot. It isn’t a fun situation. Then if they figure out if they resist they might not get the shot. They will try it every time. I would like some feed back on this, if your dog was difficult to give an insulin shot to, what did you do to change that? Also how you do give your dog an insulin shot? Mornings are still harder. Because she knows her shot is coming, she still hides and won’t eat. I’ve started keeping her food beside the bed, so when I wake up, I can feed her. She’ll eat if I do that, and I can make sure that she’s eaten by the time her shot comes. 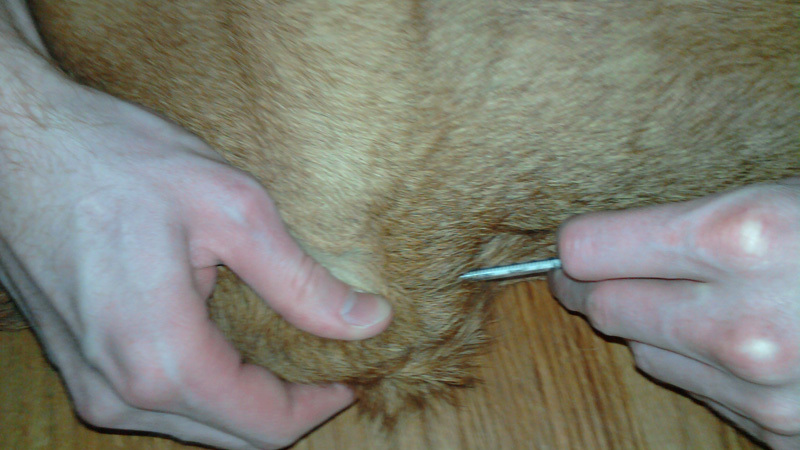 One of the things that my vet or vet tech has never mentioned in the many talks I’ve had is the position of the needle. I forget where I read it, but I didn’t know that the needle has a fine tip that should be positioned at the top. Since I’ve started watching where the tip is at, it doesn’t seem to bother her as much. Hi, I didn’t have trouble giving Taco his insulin shot, my husband holds him, it just hurt him. So, i now put numbing cream on him and wait about 20 to 25 minutes before I give him the shot. I also ordered an AutoJect2 device for giving the shot.Now, he doesn’t even know that I am doing anything, except he hears the click of the AutoJect2. No whimping or whining anymore. and the needle would come out and inject the insulin. I haven’t used or really researched Auto Inject pens much besides the price. I won’t be able to help but maybe one of my reader will comment. I found a lot of info on that site when I started researching dogs and diabetes. It is an older thread but still useful info. I’ve seen it on Amazon before. “Once the unit is cocked, the syringe inserted and the two parts screwed together, pushing the button to release the spring inserts the needle and injects the insulin. I’ve drawn up 17.5 units of water in a syringe which is what I give Bailey and timed it as it emptied the syringe. The needle was inserted and then the syringe emptied in less than 2 seconds. Bailey never had any idea he’d been injected. I’ve even injected him in places that he normally complains about with no problems. The instructions recommend waiting 5 seconds before removing the needle which is usually a good idea anyway in order to help keep any insulin from leaking back out. The only problem I’ve had with it is that the instructions can be a little confusing. Once you figure it out though, each time you use it gets faster and easier. My dog at first was fine with the insulin shots, then all of a sudden she runs, hides, moves around. Sometimes I just can’t give it to her. Anyone have any suggestions? Think about it this way. You loom over your dog, are probably nervous about giving the shot, prick your dog with a needle which probably hurts. It is a scary experience. You need to make the experience positive. Give treats, lots of praise and don’t let your dog win. Some dogs will throw a tantrum in uncomfortable situations. If you as their pack leader let them get out of the situation then they are going to do it every time. Bender did this ever time we would cut his nails. He would cry bloody murder. It took some training, treats, lots of praise. He is unhappy about getting his nails clipped but he deals. It might help to have some one hold your dog, praise and distract while the other gives shots. Asking your Vet for help with probably holding techniques so your dog won’t be able to bite you will help. Jake was diagnosed 2 weeks ago. The first night I spent 2 1/2 hours trying to give him his shot. It didn’t happen. For the next few days I would have to sneak up on him, muzzle him, pick him up (45 lbs), wrap one arm around his neck, one leg around his middle and inject him directly into his hip. I asked the vet first about injecting it straight in and he said if that’s the only way I could get it done, it was fine. As soon as one shot was given, I would start dreading the next. On the 7th day I ordered the Autoject2 and paid a little extra to have it delivered overnight. After using it twice, I no longer have to do anything but simply hold Jake’s collar, and inject. It takes about 2 seconds. It is still straight in, but I don’t want to do anything that will stress both of us again. My dog is horrible to give the shot to. I try to massage him first, baby talk, all that stuff. As soon as he feels the needle go in , he instantly almost bites me so I don’t get to push the plunger in without him almost biteing my hand off. Some days he doesn’t feel it , other days he does. Tonight Was the first night i couldn’t give It to him. I’m wondering what can I do to make sure that he gets his shot , and second what happens if he doesn’t get it?? Also, the vet said he has to take the shot within a half hour , after eating. I’m wondering if even after the half hour if it’s say, two hours after eating would it be ok to just give him the shot anyway or do I just forget about it altogether and just wait till the next day for the next shot?? Please help!! Any comments on what I should do, or suggestions for this mess, lol would be super helpful! Thanks. I would consult your Vet on training on how to restrain your dog so it can’t bite you but not make the experience negative so you can give him a shot. Your dog needs insulin after every meal, whether it is right after or two hours later (I wouldn’t recommend the latter). Simply put, as soon as your dog eats food, his blood sugar will start to go up from it. High levels of blood sugar can cause damage to his internal organs and lead to serious problems or death. Maybe look into what Melinda said and try an Autoject device. Amanda Kepfer has dog with similar symptoms to mine. I would highly recommend an animal opthalmologist. Not expensive and a great help. Don’t stop the drops. We use sodium chloride ointment to try healing ulcer but next time dog is under anesthesia will use a orocess called debridement to get ride of those rough edges. Flurbuprofin helps with pain, oflaxacin helps with infection. We use dorzolamide and latanaprost too for reducing pressure. Great food for disbetic dogs: zignature. Holidtic, low glycemic, good protein and good fiber but dogs like it unlike that gross WD. Also pure vita makes foods with high quality ingredients and uses barley, lentils and other low glycemic things. My disbetic dog eats Merrick Grain free healthy weight (foes have carbs but she loves it), plus 1/4 c shredded chicken, plus a scant 1/4 c brown rice plus 1/4 c organic salt free green beans chopped, plus 93% lean cooked and drained ground beef plus 1/4c water i boiled chicken plus a drop of Pacifica no salt bone broth . I microwave about 15 seconds. I came up with this recipe when she was ill and wouldn’t eat. She ALWAYS eats all of this (available in tiny containers so doesn’r spoil or buy big ones and freeze in ziplock bags). Key is to feed dog at exactly same time daily 12 hours apart and give shot within a few minutes everu single day. Can’t expect to give same amount of food/shot for a fifteen hour period you would give for 8 hrs and have sugar be regulated. For snacks…when i brown the ground sirloin i break off about 1/3 and firm tiny meatballs the size of marbles. Put in pan on one side with ground beel on other side, cover and put on extremely low heat so meat bakes itself. She gets two of these three times a day. Also loves salt free canned green beans, and use cheddae slices for pills (cut two slices in four strips, cut them in half, use each little strip to fold over a pill and sqeeze shut) Cheese can also be a snack. If trouble giving shot i always bring 5 pieces kibble and put on couch positioning her near arm rest so she wont roll. She associates shot with tree. Petco has a green ball perfect to out kibble in. While dog working the ball you give shot. Do on floor; if on couch vall rolls off dog goes too!! Good luck. Support is important in managing duabetes. You can do it if i can (i used to cry and puke before giving shot. I am an old gand at it. We are on our third week trying to give insulin shots to our aggressive min. Schnauzer. It took three of us to hold him. He was muzzled also.he bites and wiggles so much trying to give his shot. Does the auto injector really work? I am willing to buy it if it works. We are stressed out trying to give the shot I was ready to give up. Think of the situation your dog is in. You hover over him. Hold him down, give him a shot, which might hurt. Try making it a positive experience. Give treats when he does something good. Tell him to sit, give a treat, lay down, give treat. You sit down next to him, give treat. pet him, calm him down, give treats. But don’t reward bad behavior. If he, let’s say bites at you. no treats! But also, you can always try an auto injector. I’ve never used one but other commentors have said that they work for them. Worth a shot! My 10 year old Bichon Frise was diagnosed about two months ago with diabetes and it has been a nightmare giving his insulin. Most of the time he jumps away as I either stick the needle in or when I inject. He screams too. Sometimes the needle comes back out of his skin before I can inject and then I have to start all over again. I have tried many different things to distract him but it only works for a bit and then he figures it out. I have tried to do it while he was eating, I had him sit in front of me (praise, petting and treat), hiding a treat in a box and he tries to get it out, smearing a thin layer of peanut butter in front of him. Things that did not work at all…when he is relaxed and sleepy, putting a treat in front of him, having him beside me on the couch, pretty much any time he is not REALLY focused on something else. I love him to death but he was not very well trained (my fault). The vet said that the needle shouldn’t hurt and the it’s a behavioral thing. I do mostly agree with this as I have given it to him and he barely noticed. It gets worse once he is on to what I am doing. I do have issues a lot with inserting the needle into his skin and I am thinking that I have an issue with my needles. So maybe it does cause more pain than it should. I move the injection site around, maybe he is just too tense. I have to do these injections by myself and have read just about everything online for suggests on how to make this easier. Do you have any tricks for keeping your dog distracted while giving insulin? Also, have you had issues with needles not being sharp? It sounds like you have tried pretty much everything I would have suggested. Maybe try a different needle length? Also, where are you injecting? I usually inject Bender between his shoulder blades. His skin is loose there. I spoke to the vet about needle length, and they do not have shorter needles available for that insulin. They suggested that I only put the needle in half way, but I find that very difficult because he moves around. I am injecting it in the shoulder blade area, in and around the top area of the upper back. Has a bunch of different needles (gauges and lengths). Just make sure you are getting the same Unit size. I think U-100 is the standard size. But double check on what you are using so you are giving the same dose. For 3 weeks I was consumed with just the thought of giving my 9 yrs old poodle his shots. The moment I woke until it was time at 7:00 a.m. In the evening driving home, my anxiety was starting the moment I got into the car to go home. It was always hit or miss because my dog would jerk as soon as the needle pierced his skin. Last week the insulin ended up spraying in my boyfriends eyes while he was trying to distract the dog. It’s getting a little better by Not restraining him and acting like it’s a party after his shot. He eats his treat while I’m injecting. Regardless, I HATE to do THIS! My dog and I have trouble and stress with injections. I know he must have insulin or he gets very sick. Then he missed a dose from struggling so hard, and after the morning he got jabbed 3 Times to finally get his insulin, I knew something had to change. So, I unhappily restrain him with a muzzle(he tries to bite sometimes), I have to tie his front legs together with a cord, and I have to get on top of his head and tied front legs to hold him from moving and struggling. Sometimes, my adult son has to hold his hind legs from kicking. Afterward he gets a treat of lean chicken. I love him like a best friend and would never hurt a hair on his little body, but I do it because it saves his life. It is a mess, but we are getting through it and his health and numbers are improving. My 15 year old dog got diabetes 4 months ago. I had a horrible time giving her shots – I cried, she fought me, etc. I couldn’t get it right and twice she would up staying with vet 10 days. This past time I decided I have to do this! I now put her across my lap and put some healthy treats down and she eats those and doesn’t notice the shot. I found giving in her hip area is much easier for me to do. I still mess up once in a while – she jumps and I don’t get it all in but that is rare and the whole ordeal is no longer traumatic for either her or me! I know this is an old thread so this may not be worth writing, but figured it might help someone! I started fostering a 13 y/o diabetic corgi who HATES his insulin shots. Originally went with the two person restraint job, but most days I’m on my own giving him his insulin before I go to work, so then I switched to basically sitting on him, but he’d still scream bloody murder. The trick I figured out is that it takes him a couple seconds to chew on a piece of dog jerky (I get mine from Chewy.com), so now I shove a piece of jerky in his mouth, and while he’s chewing I can give him his shot with no problem whatsoever. When I say this dog was bad before, he was really really bad, but now he’s a perfect angel (for the most part).